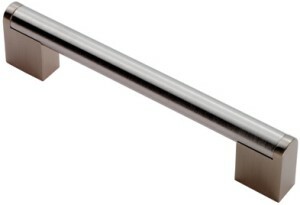 Satin stainless steel bar cabinet handle. 14mm diameter stainless steel bar handle with satin nickel end posts. Available in 128mm, 160mm, 192mm, 256mm, 320mm, 448mm, 608mm & 864mm centre to centre fixings, 36mm projection.